How about an update on Francie, our little rescue horse? She certainly has come a long way since Thanksgiving. I'd still like to see her put more weight on, and am hoping that as the grass gets more green with spring she will. I have been getting on Francie lately, after her lunging session. She gets nervous. All we do is walk around the arena slowly. I do lots of reassuring. This picture is from the third time I got on her. She wasn't having the best day. It was very windy, and she was all hormonal from her first heat cycle. She had spazzed out a bit when I first tried to get on. I backed off, reassured, calmed her down and tried again. That's my approach to training. Slow and steady. There are other methods that are quicker, but this is what I prefer. As we walked around the arena, I could sense that her every nerve was on edge. Usually she calms down from my voice, but she didn't so much on this day. I hoped that the neighbors wouldn't go flying by on motorcycles, as they tend to do sometimes; it wouldn't have had a good outcome. Fortunately, they didn't. 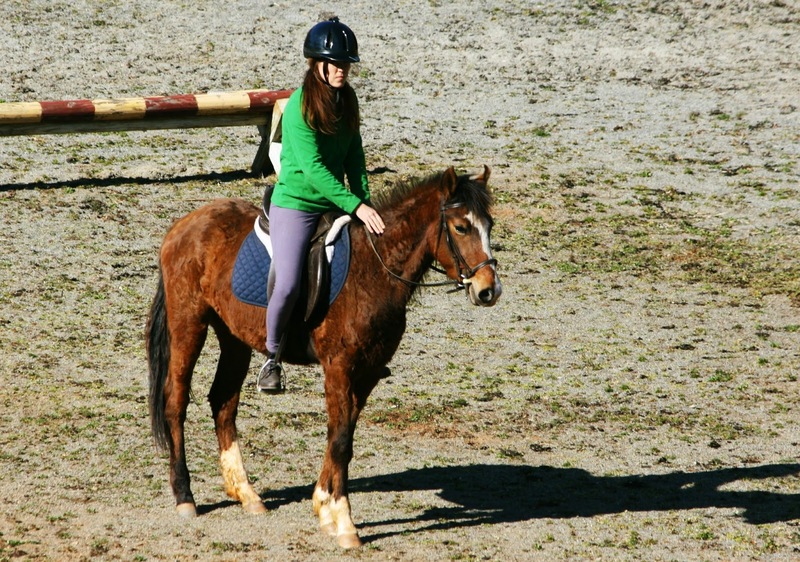 I kept the lesson short, gave her lots of praise, and hopped down. You can see me petting her neck in this picture. I am tall, but even so, you can see how stunted her growth is. She probably won't grow any more at this point, and will always be pony-sized. My hopes for Francie are to get her solidly green broke over the summer, and then find a horse-crazy preteen girl in Pony Club or 4-H who would spoil her unconditionally and finish her training. She has a sweet temperament, and I think she'd bond well with the right person. Isn't it awesome to see how much she has progressed from the sick and unhandled horse she was last November? How about that, she has the same look that Dusty gets when he isn't real happy about something but there you are on her. The weather has been so bad that there isn't time to do much but maybe today is the start of some warming. So sweet! Hope she gets better and better! She's really a cutie. Just needs some TLC!! She has come so far! Your approach seems kind and loving, and I'm sure she trusts you and that helps her to get stronger. She's a lovely girl. She's really coming along; you're doing so well with her! Hunter's horse has come a long way also, but she's still not quite ready to tackle riding him much. A good start, I have hit the ground many times trying to break a few. Time and patience will win her over Lisa -- she's so lucky to have you! What a rewarding experience. I'm sure she'll continue to thrive under your tender loving care. Thanks for the update. You have done so well with her!!! I totally agree with the slow and steady approach, and also that way you are more bonded and share trust. wow, she has really come along. I am so glad to hear of her progress. It is so wonderful that you have such a loving approach to training her. That's great to see Lisa! How great it is to have someone like you come along and lift her health up! Boy, she's a cute little horse! You have done an outstanding job. I'm glad there are folks who will help horses. I can rescue ferrets but I'm getting long in the tooth for bigger animals like horses. She looks wonderful!! and I think your plan for her is a good one. You've done such a good thing, it must feel so good to see her out there, looking so much better than just months ago. Good work, Lisa. This story does my heart good today, Lisa. I didn't see the original picture, but I'm so glad she found a loving owner. It takes a lot to break a horse. Your doing an amazing job with her. She will be the perfect horse for someone for sure. My mommy had a small horse, and not only small- but perfect! You are making so many good things happen for this little horse! You've done amazing work with her, Lisa. As with all animals (I think), Francie has responded positively to love and understanding. Sadly, she may be pony-sized for the rest of her life. But I suspect a lot of smaller people will get to love her and ride her. Lisa: I have to say that this heartfelt journey you have shared with us is amazing! It takes a special person with empathy and caring to take on the responsibility you have with this special horse. You are an inspiration to me, and many more people than you realize. I LOVE seeing her improvements so much. You are such a sweet soul Lisa….and I too hope the right person will present themselves in the future; they will both be lucky. I have a total soft spot for her. I haven't ridden in years! Good luck, you are patient! I am so glad she is making progress. Praying she will find a good home. I think Francie (Fran) is a pony. You are doing a great job on her. Francie looks like the Mustang type of Spanish Ponies in the Outer Banks in North Carolina. She looks good, yet she will look much better with more weight on. I would think in adopting her, if I had a horse farm. Maybe, one day, I will have a farm. I pray for better days coming ahead. You know I love horses, and most animals. I'm an animal lover. I enjoy reading your blog posts, Lisa, and I am happy to know you are getting along well with Fran. Please, do not forget to read my Journals post. I call it: "The Fingerprints of Chidhood Memories." Actually, one of my big dreams -as a child- was to have horses and ponies in my own horse farm. As a little child, I used to visit the Zoo very often. My dear father took me there on Sundays. Then, I was so thrilled to see wonderful animals in front of my eyes, like big elephants, bears, and so on. Well, I also dreamed to have big cats in a Sanctuary when I grew older, like lions and tigers, etc. Thank you, Lisa for sharing your world with us! These posts warm my heart. She has come a long way!